Major General James G. (Greg) Champion began his military service in 1978. He was commissioned as an Infantry officer following completion of Reserve Officer Training Corps at the University of Mississippi in Oxford, Mississippi. General Champion has held every 18 series leadership position an officer can hold in a Special Forces Group including Battalion and Group command. He was the Assistant to the Director Army National Guard fo r Deployment Issues and was the Director’s principle advisor on deployment for the Army National Guard forces with emphasis on the Global War on Terrorism and Homeland Security. In that position, General Champion was responsible for Army National Guard issues related to the deployment of forces to the southwest border. While serving as Commander, 20th Special Forces Group, he commanded the Combined Joint Special Operations TaskForce Afghanistan (CJSOTF-A), Bagram Air Base, Afghanistan, in support of Operation Enduring Freedom III. Subsequent to this first tour in Afghanistan, General Champion was DeputyCommanding General, Operations, Combined Joint Task Force 76, Bagram Air Base, Afghanistan, where he oversaw all aspects of the plans, operations and intelligence collection and managed the Afghanistan-Pakistan border security process. 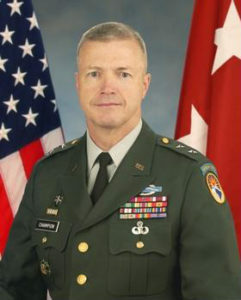 His major Awards and Decorations include: Distinguished Service Medal; Defense Superior Service Medal; Legion of Merit; Bronze Star (w/OLC) ; Meritorious ServiceMedal (w/OLC); Army Commendation Medal; Global War on Terrorism’s Expeditionary Medal ; Afghanistan Campaign Medal; National Defense ServiceMedal; Master Parachutist Badge; Special Forces Tab; Combat Infantryman Badge; Expert Infantryman Badge.